Although many residents may not know, 2432 W. Colorado Avenue wasn’t always Meadow Muffins. It wasn’t always 2432 Colorado Avenue either. At 431 Colorado Avenue, the Waycott Building was built in 1901. The opera house occupied the 2nd floor with the First National Bank taking the 1st floor and Stewart & Tiger Bicycles in the basement. The third floor, billed as “the best dance floor in the state,” was the W.O.W. Hall. In later times, Mack’s Ice Cream, where ice cream and candy were made and sold in the parlor, was in the basement, the Idle Hour Theater (vaudeville and later a movie house) was on the 1st floor, the opera house remained on the second and the third floor was a meeting place for various city lodges, including the local Independent Order of Odd Fellows. This first floor eventually became a furniture store and the 2nd and 3rd floors various offices. Meadow Muffin’s opened in 1979 and was a quick hit with Old Colorado City residents. Showcasing various curiosities and antiquities from movie lore, it was a unique and popular place to eat, drink and dance. 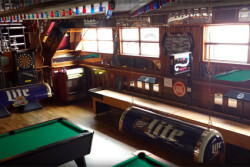 After Meadow Muffins closed in 2014, the historic space was purchased by Rob and Susan Hirt, owners of the Hatch Cover, and their partner Jill Kolman. 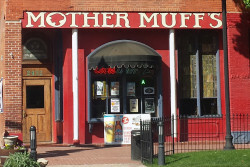 After a few renovations to restore some of the building’s historic charm, the restaurant and bar was reopened as Mother Muff’s Kitchen and Spirits, with a focus on good drinks and delicious breakfast food (served until the bar closes!). Our breakfast menu features classics like omelettes and pancakes, plus some of Mother’s favorites, like bacon bowls, breakfast pizza, chicken and waffles and more! Not in the mood for breakfast? We also offer a variety of burgers (you gotta try our cronut burger! ), sandwiches, and pizza, plus Mother made juicy prime rib on the weekends. Take a look at our full menu. Mother needs a drink after a long day, and we have just what she needs! Try our awesome fresh juiced Bloody Marys, Bubble Juice champagne cocktails, Naughty, Naughty, Bad! Milkshakes, Curfew Extender Coffee Drinks, and, of course, our Mother’s Little Helpers cocktails. When the sun goes down, Mother lets her hair down. Check out Bloody Mary’s Back Bar with tons of TVs showing your favorite sports, plus darts, pool, and shuffleboard in the lower level, and live bands playing either on our upper level or in Mother’s front room. The Back Bar is also available for private parties. Contact us for more information. The fun never stops at Mother Muff’s! We have Pikes Peak Poker every Thursday at 8:00pm, Two Smoking Barrels Family Jam Mondays from 8:00pm-11:00pm, and Sundays are double the fun with Easy Like Sunday Morning Jam Band Brunch 11:00am-3:00pm and Geeks Who Drink at 7pm. See our Calendar for all upcoming events. Mother wants you to know your history, so we’re showing our respect for the Waycott Building’s past by displaying photos and artwork from the Old Colorado City Library and Old Colorado City History Center, and allowing the original architecture of the space to shine through. 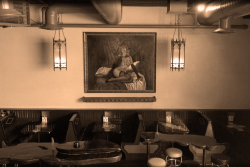 We still have some old Meadow Muffins favorites, like the Casablanca fan above the front room bar and the famed portrait of our favorite lady, be she Miss Muff’s, Laura Bell or the unknown mystery woman, in the buff back in Bloody Mary’s Back Bar.